Instagram has become more than just a platform for sharing pretty images with filters, emojis and hashtags. Since its beginnings in 2010, Instagram has grown to become one of the top three social networks alongside Facebook and Twitter. Instagram’s mobile-focused platform has often been credited with aiding in mass adoption. With over 300 million active users, Instagram is prime real estate within the influencer marketing space. Instagram allows influencers to visually share products and services with their followers in a distinct visual format that no other social media platform competes with. The heavily graphical platform allows for a real-time social and creative image sharing experience. And this new format is venue that marketers are exploring to help reach their target audiences. There are many ways marketers can leverage Instagram as a tool, and it can be relevant for pretty much any brand target. Of course, having an active community management strategy on Instagram has proven to be an effective strategy, as well, for brands like National Geographic, that has an impressive 19.1 million followers. GoPro is another example of a brand dominating the Instagram space by constantly pushing great content that genuinely interests their audience. Establishing your brand on Instagram is a good first step. But obviously Instagram is very visual-content heavy, and can take up a lot of resources and time to make the impact a brand is really looking for. The worst thing you can do is launch an Instagram channel, and leave it empty. There are really two main tactics marketers are using on Instagram: Sponsored ad campaigns and influencer marketing programs. After being acquired by Facebook, Instagram launched sponsored ads in November 2013, allowing brands the option to purchase sponsored advertising spots that push photos to all Instagram users, even if they don’t already follow that brand. Instagram’s Q&A page states that their “aim is to make any advertisements you see feel as natural to Instagram as the photos and videos many of you already enjoy from your favorite brands.” Although Instagram has attempted to make these sponsored ads native and flow within users stream, sponsored ads are still marked and noticeable when scrolling through the feed. Huge brands like Nike, Ben & Jerry's and Starbucks are all spending big advertising dollars on Instagram sponsored ads. While paying for ads may buy some top funnel awareness, it can get pricey and may be less effective at reaching your target audience than more organic ways of building communities on Instagram. With sponsored posts you may widen your reach, but how can you know you're reaching the right people (i.e. your potential customers)? Partnering with influencers on Instagram helps increase brand trust and loyalty. Paid ads can be a good way to reach a lot of people and convey a message, but leveraging influencers to help spread your message tells a much more compelling story. A great example of a beautifully executed B2B Instagram influencer marketing campaign is General Electric's #GEInstaWalk. The brand invited a small group of individuals on a tour of a GE research-and-development center and encouraged them to share their experience on Instagram with their followers - providing their thousands of new audience members with exclusive access to GE’s inner workings. 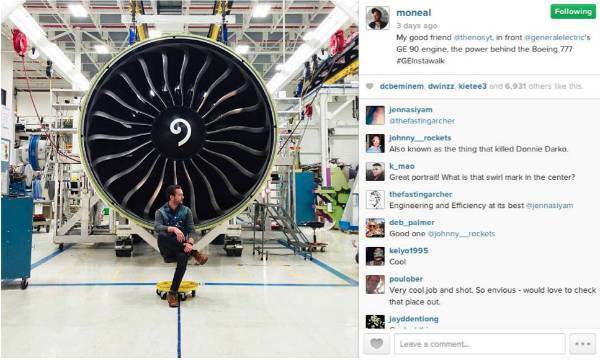 The group included six Instagram influencers and six GE “superfans,” with a combined 3.5 million followers, to tour the GE Aviation Test Operations Center. Within the first 48 hours, they had created more than 200 social engagements. By hand selecting a group of existing brand advocates (superfans) to accompany influencers with a large reach, GE ensured engagement and continued to foster relationships with those who can move the needle for their brand. Starwood is another brand doing a great job leveraging influencer marketing on Instagram to make their customers and influencers feel appreciated, foster relationships, widen their reach, and get in front of the right audience. With the mission to "surprise and delight" their guests, Starwood carries this philosophy into their influencer marketing practice. How can you start an Instagram influencer program? First, identify your influencers. Analyze your target audience to find out what they are interested in and who they are following/looking to for advice. Once you know more about your audience, you can begin to build your influencer list. After you have identified your influencers, it is essential that you create and foster relationships with them. Building rapport and having working relationships with influencers will yield great returns when you ask them for mentions or product placements down the road. Create partnerships with your influencers. The most effective Instagram influencer marketing strategies are not centered on one-time posts from random users who have a lot of followers, but rather partnerships between influencers and brands. Once you’ve built relationships with your influencers, start planning long-term projects together. When done correctly, leveraging Instagram to build relationships with top influencers can prove to be very effective. To help scale your new Instagram influencer marketing program, Traackr can help.